It has been a touch over two weeks since my last blog entry and plenty of the proverbial water has flowed under the bridge in those 14-plus days. Coming off my 5km PB, I had much to look forward to in the form of events. 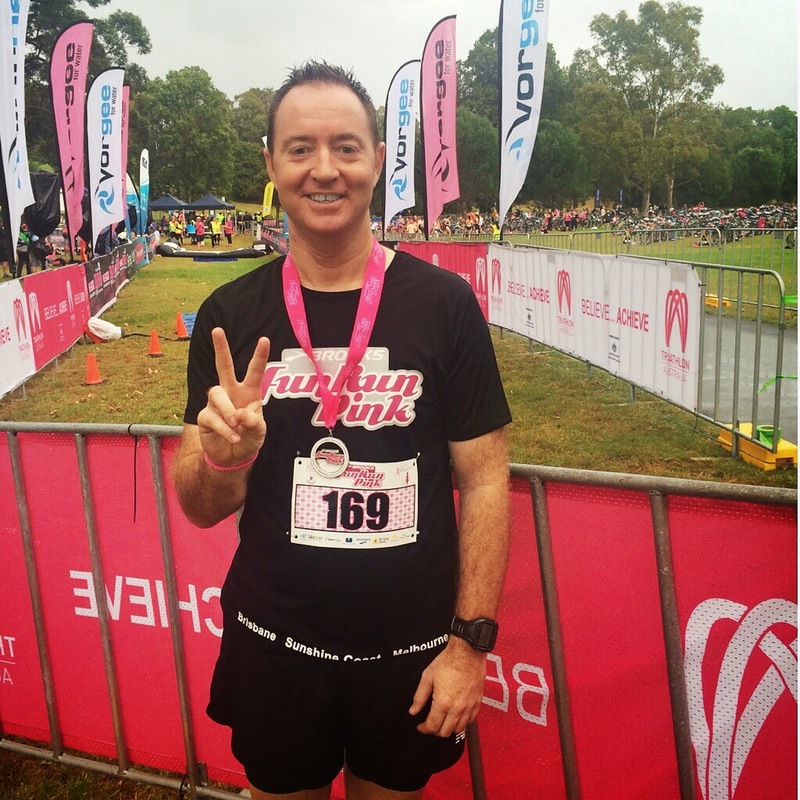 FunRun Pink at Parramatta Park on March 20 was to be followed by my second triathlon over the Enticer distance eight days later at Batemans Bay. 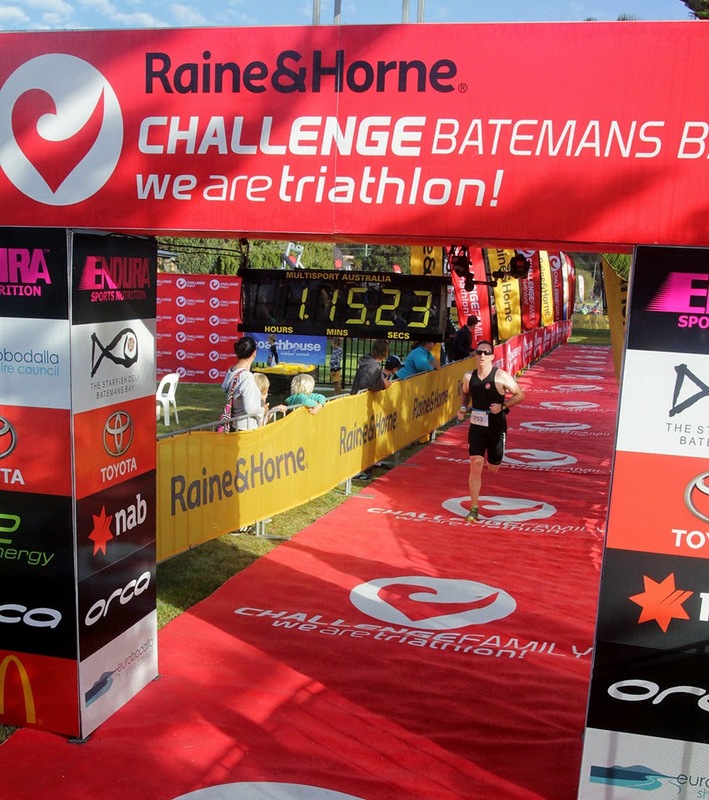 I was keen to do as well as possible at Parramatta, however having done the same run in Melbourne, I had an inkling that the course would be a little more than 5km. The reason being that the finish chute is not factored into the course distance. I found myself fairly prominent early in a field of around 100 and I managed to stay there. The course was a two-lap out-and-back layout with a long gentle incline at the start. The bonus with this was that it was a long downhill run home. I traversed the 5.1km course in 24:28 and finished 10th overall. The run made me realise that I was now a genuine sub-25 runner, possibly sub-24 over just 5km. It was then onto a week of mixed training before heading into my second triathlon. I warmed up the day before by doing my local Parkrun (Sandon Point). Not only did I run my personal best at the course, I also ran a new PB for the 5km of 23:11. The time was a surprise as I felt I could go faster than that. It will be interesting to see if I can maintain my improvement over the distance. It wasn't long after that we were in the car and heading a couple of hours south to the Eurobodalla Shire for some triathlon fun. This one would be slightly different to the first one I had done, with the bike leg (10km) some 3km longer than Wollongong. I had been disappointed with the way I'd ridden in my debut and had put some work in on the bike, particularly climbing efforts. I also had a professional bike-fit done and was hoping that the work& modifications would help me perform better. 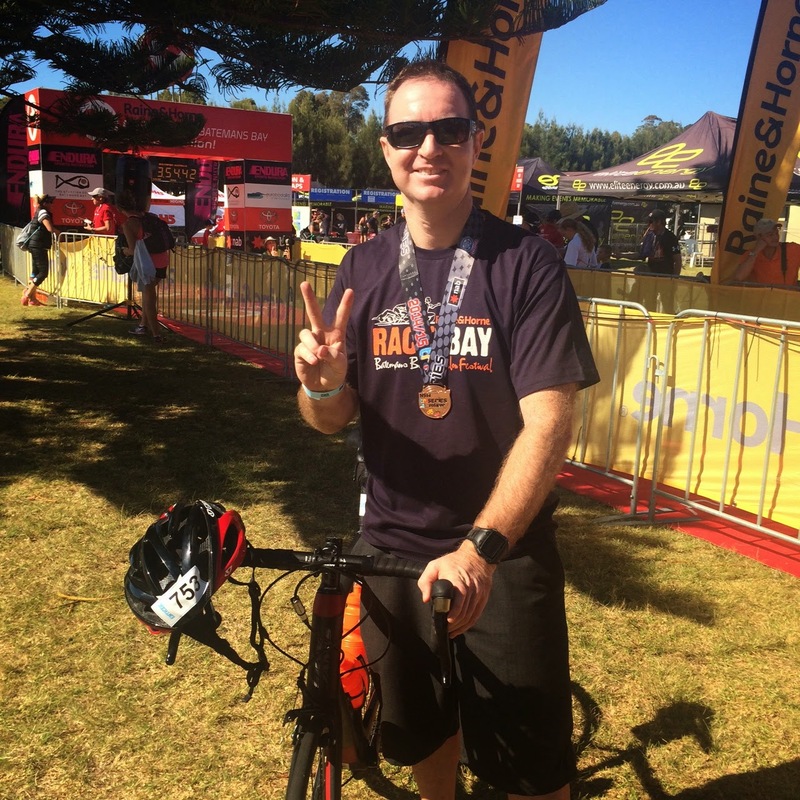 After arriving in Batemans Bay and doing a quick scout of the course, it was evident that there would be a couple of nice inclines to contend with, it was certainly the type of challenge that I was keen to try my hand at. A minor disaster struck on race eve when, during a short spin on the bike, my front derailleur decided to malfunction. I spent a couple of hours getting it operational again before having it fine tuned by the on-course mechanic on race morning. It is one of those unexpected elements that you simply do not envisage in the lead up, I think it is important to try and deal with them as calmly and rationally as possible so as to not waste any energy. Race morning saw fresh weather and a beautiful sunrise. Despite the cooler air, the water would be nice and warm. I plodded through the swim relatively unscathed. It still feels to be my weak leg but something I am desperate to improve, particularly in the endurance department. I exited the water 17th overall and 2nd in my age category. I made the effort to get to T1 quickly and felt I made the most of the run from the water. My effort in transition however was nothing short of ordinary and another facet that I will work on hard before next time. Jumping on the bike, I felt a little average at first, but I quickly found a rhythm. I found I was able to pass people on the climbs and, more often than not, stay in front of them. I was found out by one hill at around the 8km mark of the 10km out-and-back course but overall felt I had done ok. I had actually done even better than I thought, I had finished sixth fastest overall out of the 103 competitors and led my age group in the leg. I felt a lot quicker in T2 and wasted little time in getting out on the run leg. As expected, my legs felt like a pair of 100kg anvils after jumping off the bike and gave me the illusion that I was hardly moving. I managed to work hard on my form and really honed in on maintaining a fast cadence. I churned out the 2km in 9:19, which was an improvement on my first triathlon and not a million miles away from my full potential based on current run times. The biggest surprise laid in the results. I had finished 11th overall from 103 competitors and snared second place in my age group. I certainly was not expecting that! Second placing at Batemans Bay. To top off a great day, my partner also grabbed an age-group placing in the Sprint distance, so we both went home with some excess baggage in the form of a medal. Now that I have completed two Enticers, I have decided that my next triathlon will be a step up to the Sprint distance. 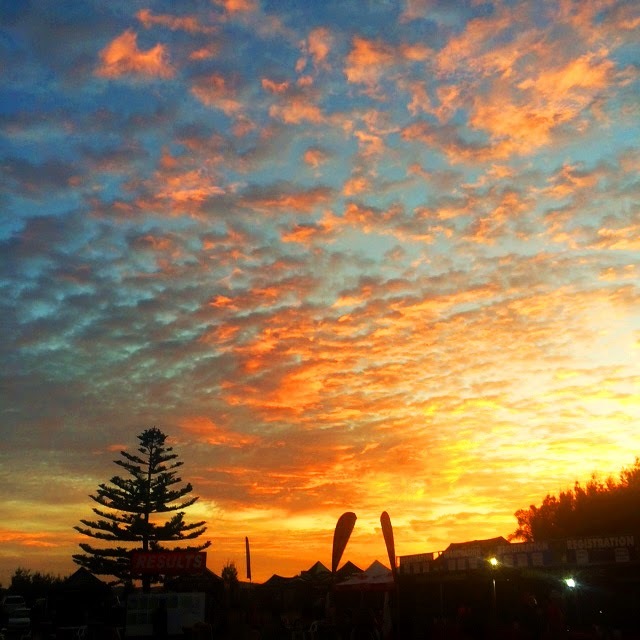 That event will be at the picturesque Port Stephens in late May. That length of time gives me ample time to prepare, I can’t wait. My next event will be the 70km Blayney to Bathurst cycling sportif on April 12, it will be the first cycling event of any type that I have ever competed in and it should not only be a lot of fun but also a steep learning curve. I’m really looking forward to training hard over the next few weeks to give myself a good base for my next triathlon.